How to create Aukro panel? 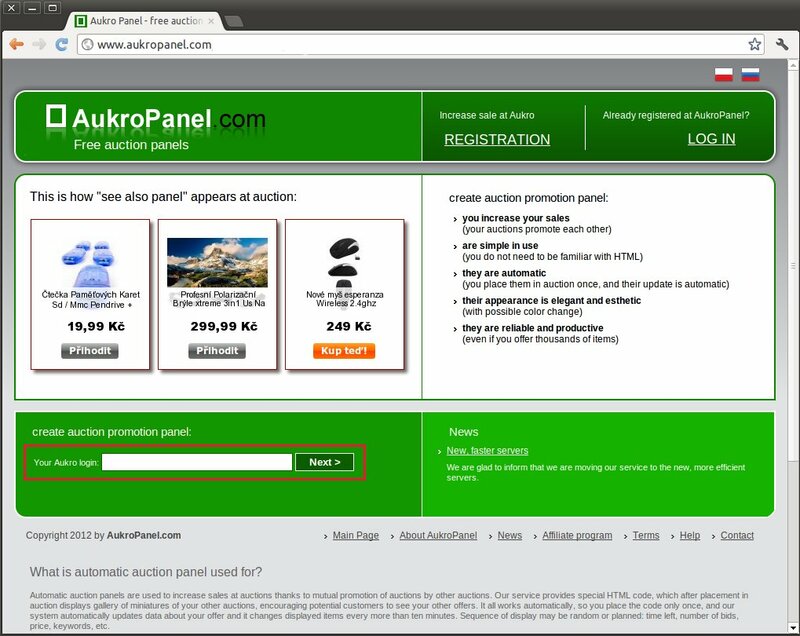 How to create Aukro panel?How to place the panel into auction?How to change appearance of the panel?How to define sequence and scope of an auction?How to hide the auction title?Automatic panel deletion from auction descriptionHow much does it cost?Auction panels templateseBayPhotogallery.com - opinionsHow to launch a shop on Facebook? Perfectsniper.com - opinionsIntelligent matching modeHow to create a panel of comments?What does that mean - Panel expired? How to place the panel into auction? How to change appearance of the panel? How to define sequence and scope of an auction? How to hide the auction title? How to launch a shop on Facebook? How to create a panel of comments? What does that mean - Panel expired? 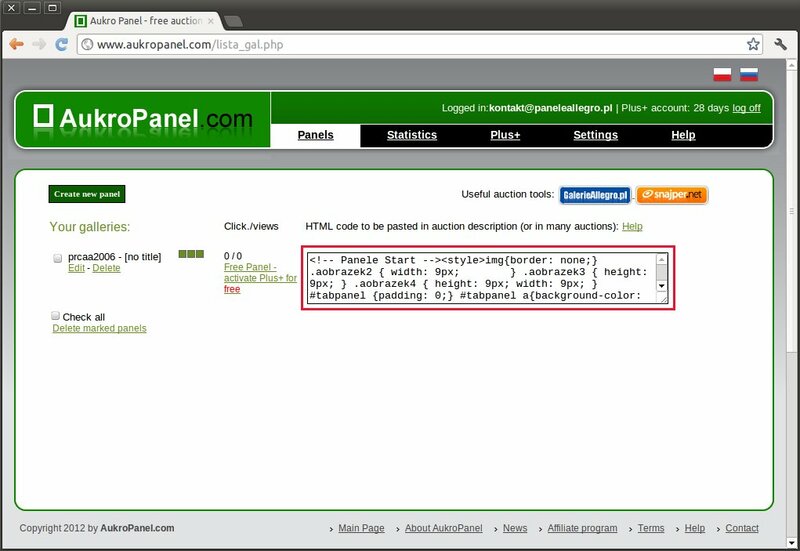 Creating auction panel is very simple and it does not require registration. 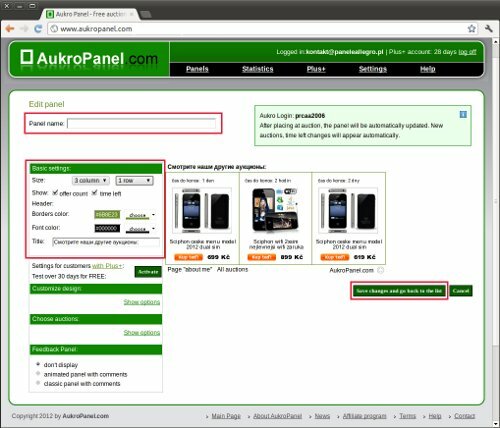 Enter your Aukro login at the home page and click "Next"
After more than ten seconds you will go to the screen, where you can see preview of the panel with your auctions, and you may name it, change its appearance and select, which auctions should appear in the panel (e.g. by keywords). 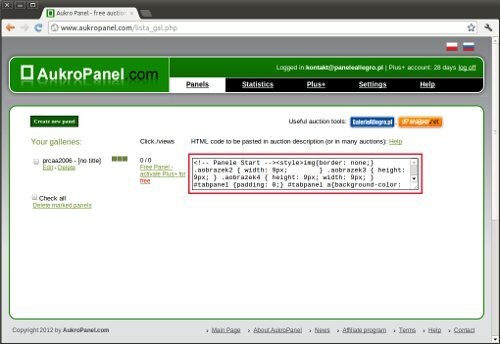 Detailed instructions how to change appearance of the panels and set up the scope of presented auctions. After you make necessary changes, click "Next"
Now, our panel is ready to place it into auction description. In order to do that, you should copy HTML code visible at the page and paste it into the description. It is important that if you create auction description using "Aukro visual editor", you have to switch to "HTML editor" tab before you paste a gallery code. After pasting, you may switch to the "visual editor" screen again. Detailed information regarding the code insertion into the auction description you may find in help section. One panel may be placed in as many auctions as you wish. The panels obtain full functionality not earlier than after establishing the account in the service.